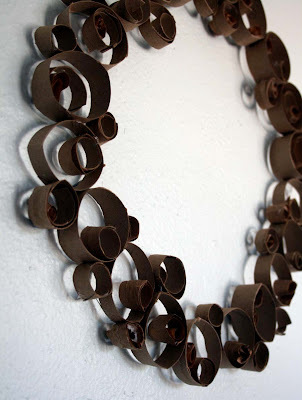 Today, I had the bright idea to make a non traditional wreath from cut up cardboard rolls. 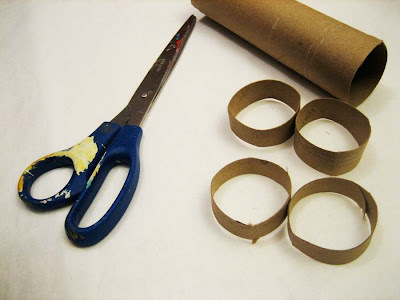 Start by cutting the cardboard rolls into sections- varying in width. 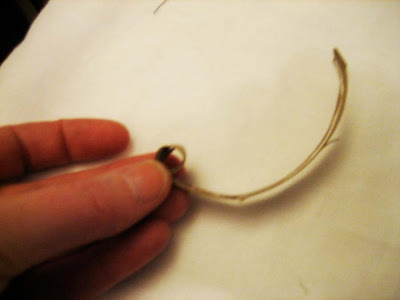 Line up the sections into a circle- this could be small (even ornament size) medium or even really large! 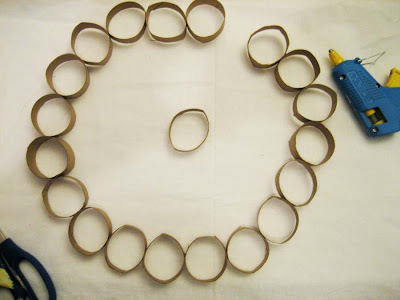 Glue each section together and start forming the shape of the wreath. 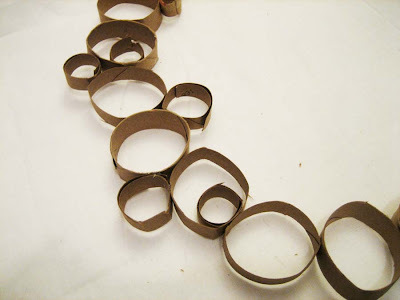 Once the wreath is complete, begin to make small circled from the rolls or even from cardboard boxes- roll strips up into a circle. 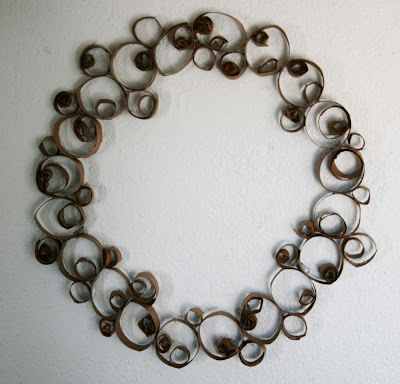 Build up your wreath with as many circles as possible. Once you are satisfied hang it on the wall!! I ended up painted my wreath black to match my living room decor! 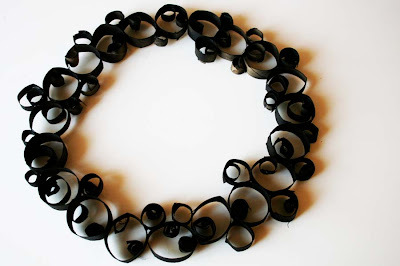 This is like a modern day version of quilling. I'd enjoy this wreath year round. Thanks for the fun idea. I've been collecting toilet rolls not realizing what I would use them for. 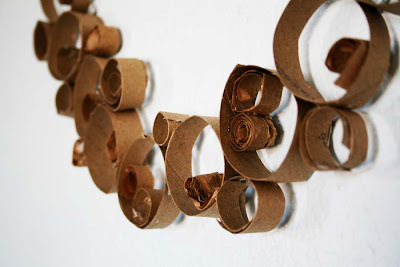 This is the second project in 24 hours that I've seen using toilet rolls -- I think it is a sign! Thanks for sharing this. now i know exactly what project i will do with my 2 year old. thank you for the tutorial. Ooh I love this! I can't wait to make one. I'll be linking as well. i jsut love your projects! so great! Cannot wait to try this, thanks! Wow, this is such a cute idea! I love that you can spray it any color you want and make it match anything, and it wouldn't cost a dime! So cute...LOVE IT! awesome idea...now i will have to start collecting rolls! Thanks for the idea. That wreath is REALLY cool. Ingenious!! This is wonderful -- I'm going to try one with my kindergarten students! so many philosophical thoughts. I love circles. Wonderful application. I just happened to come across your blog today. I love it! 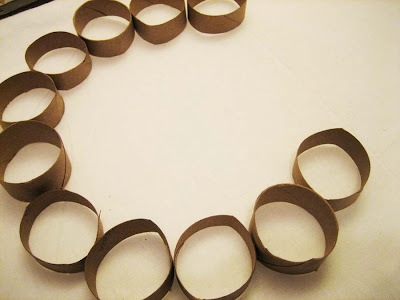 I am trying this toilet paper wreath first! 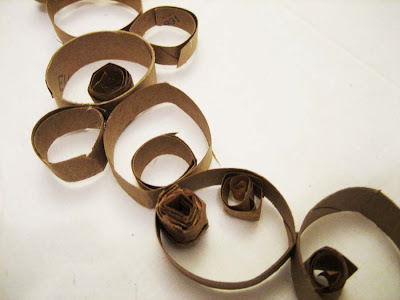 i love everything you make.this is what i made from paper rolls. http://bisozozo.blogspot.com/2011/10/my-first-artwork.html. (hope you like it! ).keep up the fantastic work! Please let me tell you that you have such talent!A great transformation to have something nice! Please visit my web site if you like,you are welcome!